In just three days, the Arizona Diamondbacks and Colorado Rockies will play in the first ever game at Salt River Fields. The D-backs announced today that the opening game is sold out, with a full house expected to be in attendance. It is sure to be an exciting environment come Saturday afternoon for not only the fans, but the players and coaches as well. 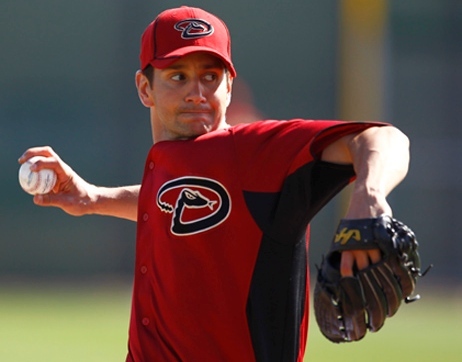 After several days of practice, the D-backs are eager to compete in a game. “I remember what it was like as a player,” D-backs manager Kirk Gibson said. “You get up there without the turtle around you, it feels way different without the batting cage. You’re a pitcher and there’s no screen there, that’s different. The fans will be there. It will pump them up. Salt River Fields figures to not only to be packed on Saturday, but all season long. The D-backs announced that 120,000 tickets have been sold for their 17 home games. Following Saturday’s opener, the D-backs will take on the defending world champion San Francisco Giants on Sunday and the Rockies again on Monday afternoon. Brian Sweeney is one of the several relievers fighting for a job in the D-backs bullpen this spring. Sweeney is a non-roster invitee to Spring Training, but is familiar with the challenges of fighting for a roster spot. Sweeney has spent parts of four seasons in the Major Leagues with both the San Diego Padres and Seattle Mariners. Last season, Sweeney notched a 3.16 ERA in 37 innings for the Mariners. While camp is only in its second week, Sweeney is pleased with what he’s seen so far. Before Wednesday morning workouts began, the D-backs received a visit from US Navy Seals. The visiting members spoke to the entire team on a variety of topics including mental toughness. After tomorrow’s workout, D-backs players and coaches are hitting the fairways and greens in a team golf outing. Gibson estimated that more than 40 people are attending the event. Before the golfing begins, the team will hold a workout in the morning. On Friday, the busy Spring Training game schedule kicks off for the D-backs when they face off against the Giants. Thursday’s golf event provides the team with a chance to relax before games begin. “We’re trying to do something together, and spend some time together before we get after it,” Gibson said. I really hope Sweeney does make the team. I interviewed him last summer as a member of the Mariners and I know how hard he has worked in his career. He has a good mind for the game and a really great changeup too! I haven’t been around Sweeney all that much yet, but from what I can tell, he does seem like a nice, down-to-earth guy. There are always people every spring that make an impression on me (Ryan Roberts two years ago, for example; Cole Gillespie last year) for being really positive, approachable people. I root for those types of guys to make clubs, too.